Though they inspire romance, dining rooms get very little use. 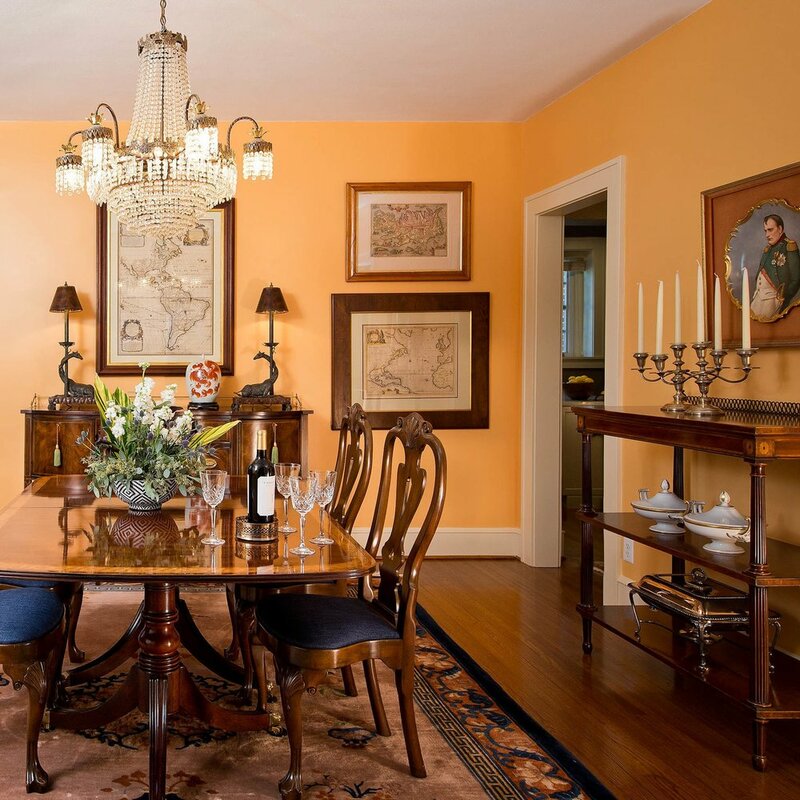 For some people, the dining room represents an old-fashioned ideal, harkening back to an era of fancy dinner parties where aspic jiggled on fine china and women wore pearls. Others think of it as the room for when everyone comes into town for Thanksgiving, too big a setting for a dinner party for four. Here are some tactics I recommend to clients who have asked for advice on how to get more use out of dining rooms that don’t insist on daily use. More than one client has asked about how to use a large table when seating only four or six people. My favorite tactic is something I call The Secret Garden. Massing plants, flowers, and lanterns at the ends of the table fills the surface and creates a sense of romance and intimacy. The plants can be borrowed from elsewhere in the house or, in their stead, tall clippings from shrubbery and trees can be placed in tall glass vessels for a similar effect. I love this approach because it uses a little bit of stagecraft to make the dinner feel all the more unique and cozy. Many clients have elegant heirloom furnishings and think this boxes them in to styling the table formally. Embrace the carefree spirit of eclectic design by dressing the table in high contrast to the furnishings. A great tactic for setting a Bohemian table is using joyful patterns in cloth and napkins, mixed sets of dishes and glasses, and a spray of small flower arrangements and candles in assorted holders. 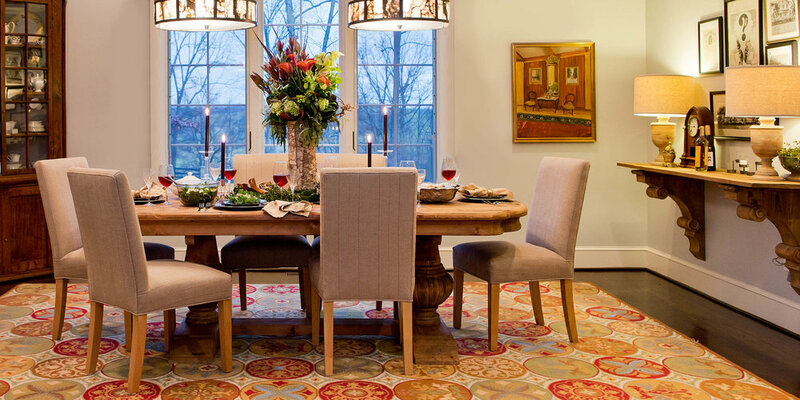 Less structure and more variety and color will take the chill off even the most refined dining room furnishings. Obviously, another option is to own the formal connotations and embrace the elegance. Throw a dinner party for a friend on one of their big birthdays. Too often what is missing from our grab-and-go, casual modern lives are reasons to dress up in style. That doesn’t mean you have to have the kitchen skills of Ina Garten to create a memorably swanky affair. Ordering takeout from your favorite local kitchen is effortlessly elegant on your grandmother’s china and a champagne brut sparkles like sunshine in a crystal goblet. Add a card game with dessert to maximize the use of this special space. 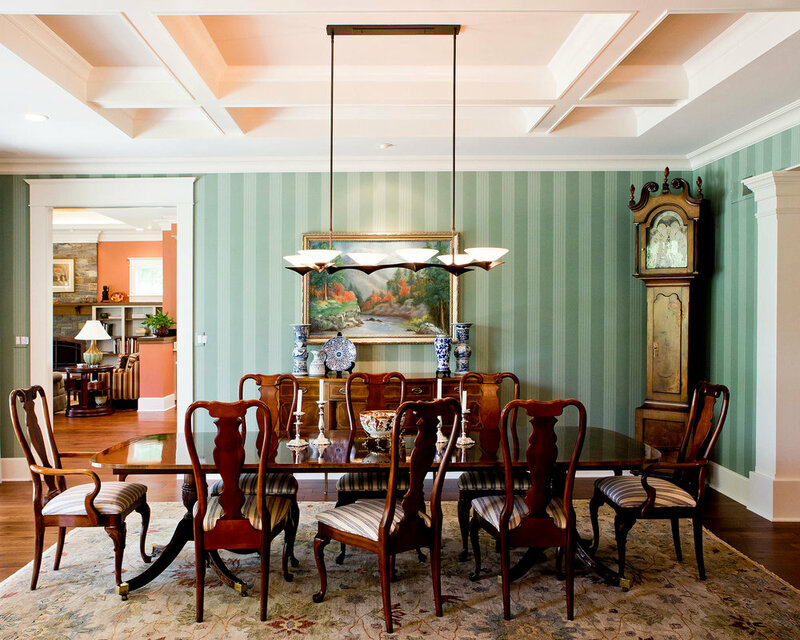 The best approach to make sure you will use the dining room is to design it with everyday use in mind. Offset a formal dining set with a bright wall color or vibrant wall paper pattern. Use a contemporary light fixture for stylistic contrast. Choose fully upholstered chairs in a performance fabric like Revolution or Crypton to make it easy to gather for hours in comfort. With the right relaxed design choices, the dining room can become a favorite everyday space on your home. Want more useful tips? See our previous post in this series - 6 Ways To Steer Clear Of Trend Dead Ends. If you are interested in our design services, please tell us about your project!